Over the last few days I’ve been busy baking. 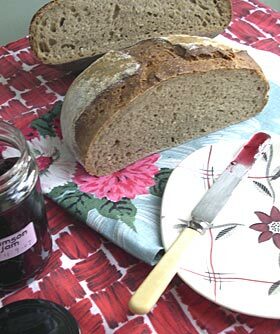 I first began making sourdough bread last year starting my leaven starter from scratch. Baking for me has always been a comforting activity and I would consider myself experienced at bread baking, but sourdough baking is quite different and requires a different approach. Life was already pretty stressful and growing and feeding the starter almost tipped me over the edge. My sourdough adventure very nearly became a sourdough nightmare. Years ago I remember a Paddington bear animation on TV where he is making porridge that keeps expanding, oozing its way over the top of the pan and down the side of the cooker until it all goes out of control and the porridge engulfs his house. This cartoon image was one that came to mind many times over those first few weeks. I was using expensive organic flour to feed the leaven and couldn’t bring myself to throw any of it away as day by day it expanded and seemed to take on a life of its own. Then I started to make it into bread and the dough was wet and unmanageable. In the middle of the night I’d be on the forum on Dan Lepard’s website trying to find the key that would make my baking comfort blanket wrap me up all warm and cosy again. Well, I am nothing if not persistent and I was determined to crack it. Hydration, hydration, hydration I began to chant. I bought some digital scales and measured everything with precision and then it all started to fall into place. I am still not sure that my ‘kneading’ technique is quite like Dan Lepard’s but I can now turn wet sticky dough into a posh loaf, perhaps not yet the smartest-looking artisan bread but not far off. This morning, for breakfast, I had a slice of the ‘best barm bread ever’ spread with organic butter and homemade damson jam. I closed my eyes and savoured the taste as I was eating it, appreciating every moment. If it wasn’t for the fact that my espresso machine broke last week life would have, for that moment, been pretty damn near perfect.